This year, as part of ‘The Big Scoop’ dog fouling awareness campaign, Dogs Trust is taking part in TidyTowns 2018 under the Special Award Category. 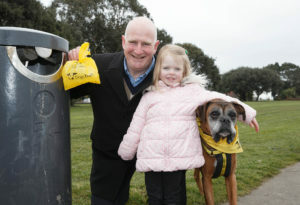 The Big Scoop Award aims to encourage dog owners to take responsibility and pick up after their dogs, thus reducing the amount of dog poo being left in public spaces. Dogs Trust would like to see every TidyTowns committee, old or new, applying for The Big Scoop Award and choose an area in their community where they have found dog fouling to be particularly problematic. The community who wins the award will have demonstrated the most creative and sustainable way of dealing with the issue of dog fouling in their community. A recent Behaviour and Attitudes survey found that 7 in 10 people claimed to have walked in dog poo on the street, 60% in a park, 44% in the house, 43% in the local children’s park, 24% rolled a buggy through it, 20% rolled a bicycle through it, 10% rolled their wheelchair through it. Aside from the yuck-factor of stepping in dog poo, there can be major health implications associated with it. Dog poo can contain nasty bacteria such as E-coli and parasites like roundworm, the larvae of which can cause loss of vision. That is why Dogs Trust wants all communities to come together to encourage dog owners to be kind to their community and scoop that poop! Dogs Trust has created an animation which emphasizes the issue of dog fouling and those that it affects, while also highlighting how simple it is to be a responsible dog owner. If you want your TidyTowns Committee to get involved all you have to do is visit www.dogstrust.ie/TidyTowns to download an application form. The closing date for completed application forms is May 23rd. To be sure you have enough time to complete your project before then, Dogs Trust recommends you download the application right away and get your thinking cap on and your committee ready! If you want to check that your town/village has a TidyTowns committee, check out the ‘Get Involved’ section on www.tidytowns.ie. You will find steps on how to contact your local committee or how to set-up a committee if there isn’t already one. The Big Scoop Award is looking for the most inventive and long-term solutions – so don’t delay, download the application form today and have the poo bags at the ready! Let’s make 2018 the year of The Big Scoop! 2. Source: Mateus, Teresa, et al. “Multiple Zoonotic Parasites Identified in Dog Feces Collected in Ponte de Lima, Portugal—A Potential Threat to Human Health.” International Journal of Environmental Research and Public Health, vol. 11, no. 12, Jan. 2014, pp. 9050–9067., doi:10.3390/ijerph110909050. • 92% of dog owners (sample of 370) do pick up their dog’s poo. • 68% of (999) surveyed claim they often witness dog walkers not cleaning up after their dog. • 53% also indicated that there is a big problem with dog fouling in their area. • 7 in 10 claimed to have walked in dog waste on the street, 60% in a park, 44% walked dog poo in to the house unbeknownst to themselves, 43% came across dog poo in the local children’s park, 24% rolled a buggy through dog waste, 20% rolled a bicycle through it, 10% rolled their wheelchair through it.